This a post by Sommer G.
I suppose I've always been a bit interested in Bigfoot. When I was young, I didn't really think much about it. As I got older, and would occasionally see things about the subject, I thought to myself 'there must be something out there.' There were just too many people reporting sightings for it to be nothing. I never gave enough thought to the subject to actually go to the library and research it, though. I just had an open mind when the subject would come up and didn't count anything out. Say what you will about the show "Finding Bigfoot," but it was that show that really sparked my interest. My kids loved the show, and it was great to hang out together and watch it as a family. We have 4 kids, and they each have very different personalities and opinions, so the show prompted some interesting conversations within our family. My daughter especially loved Cliff Barackman and his take on things. He presented the evidence in a way that all the kids could understand, and us parents, too. Anyway, we became fans of the show and would talk about the Bigfoot phenomenon while we watched it, but that was as far as it went. 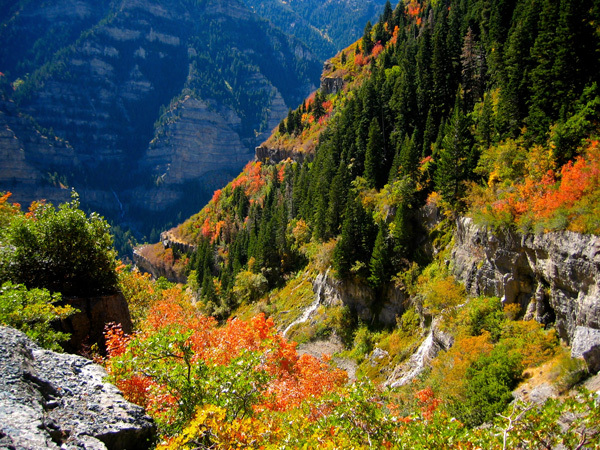 It wasn't until the Provo Canyon event that we really sat up and paid attention. One day, our daughter came home from high school and said "Mom! There are bigfoots in Utah!" She said that she had heard about it over the morning announcements. That same day, our other kids all came home and said similar things. We have 4 kids in 4 different schools-- they all had heard something about 'Bigfoot being found in Utah' during school. Teachers talked to them about it; administrators discussed it during announcements; the other students talked about it in the lunch room. We turned on the news that night and, what do you know, someone had filmed an alleged Bigfoot in Provo Canyon--- which is where we live! We live just up and through the canyon, where it opens up into a mountain valley. Best I can figure, we are probably 15 minutes up the road from where the footage was taped. This brought the whole Bigfoot idea real close to home. Our kids wander around in the woods all summer, unsupervised. They go fishing or swimming in the creek, or just hang out with their friends doing whatever kids do. This news made me worried-- if these creatures do exist, should I let my kids go into the woods? What do people know about these animals? Are they predators? I wanted to learn what I could. So, I searched Provo Canyon Bigfoot on the computer and stumbled upon an interview of the folks who had captured the footage. The man interviewing them was named Michael Merchant. I listened to him interact with these folks and felt like he was an intelligent man, and wasn't crazy. He sounded like he knew what he was talking about, and was respectful but entertaining, so I checked out a few more of his videos. I followed him quietly, and his group, for quite a while. I found out about Bart Cutino from this group, and looked into his work. I have to be honest, the Sierra project is incredible to me! I gradually began to look closer into the Bigfoot phenomenon, little by little, every day. Eventually, I found the FB/FB page. I was blown away by the difference between them and what I was used to with Mr Merchant's group. There, I read that someone had shot one of these creatures and that it was going to be in a movie. I quietly followed the situation. Finally, just a couple of weeks ago, I couldn't hold my tongue anymore. I commented on a post in the FB FB page and asked some questions. Of course, the admins never responded to my questions, but I got the opportunity to talk to a few other folks who had seen my comment and connected with different groups of people. Here is the point of my letter: I was a silent observer for a long while. When I finally decided to jump in and say something, I was blown away by what I found. I found a community filled with so many different factions it will make your head spin. I found outright lies and misleading statements. I found infighting and back biting. I found jealousy and malicious slander. I found immaturity and I found some real nut jobs. However, I also found some incredible people who I now call "friends." Once I was able to wade through all the crap, I found some amazing, intelligent, rational people who were kind enough to befriend me. I found folks who were willing to teach me and talk with me. I found people who would not only answer my questions, but would dialogue with me about the subject. There are definitely some crazies in the Bigfoot Community, and some real jerks, but the majority of folks I have met have been real, good people. Hence, my "Open Letter to the Bigfoot Community." I just wanted to tell you all that, yes, as an outsider looking in, I have observed some ridiculousness, but I have also seen a community of people who have a common goal. They want to learn, and to teach. I have met some terrific people and have had some great conversations. So, I am writing this letter to you all to say "thank you." Thank you, folks, for allowing a gal like me to come in and learn all I can. Thank you for treating me kindly and helping me along. One day, I hope to know definitively if these creatures exist or not. For now, though, I am happy to learn, and am thankful for the opportunity. You are an amazing group of people. Keep on doing what you do. Your story is darn near identical to mine, except for the location. I'm in the center of the great lakes and didn't realize there were sightings so close to where we camp and vacation just north in Canada. My groups page is https://www.facebook.com/pages/Bordertown-Bigfoot/331971796904444?fref=ts and our website is www.bordertownbigfoot.wix.com/home Check us out, we would love to have you as part of the conversation.